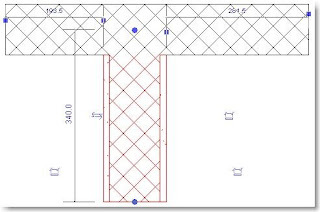 Hatch patterns can be manually positioned on a wall to suit brick coursing or other setting-out requirements. 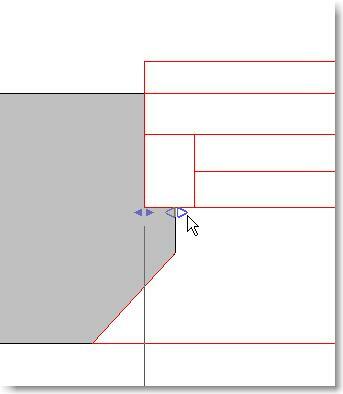 Normally you do this in an elevation view or 3D view using either the 'Move' tool or the 'Align' tool. 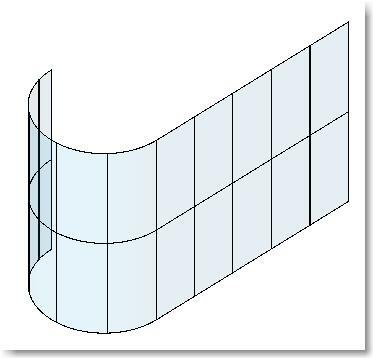 If you have a curved surface (like the one shown here), it is not possible to adjust the vertical lines in an elevation view or 3D view with the above mentioned methods. To adjust the horizontal lines, select a hatch line in elevation or 3D view. Select the move tool and manually move the hatch line down until it snaps to the head of the reveal. 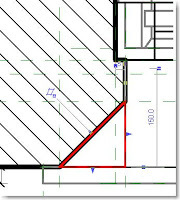 The vertical hatch alignment updates as shown here. If you try this process for the vertical lines it will not work. Instead, select a vertical hatch line. This time, pick the Rotate tool and you will see snaps appearing if you hover over the base of the wall as shown. Click on the end point at the reveal to adjust the vertical placement of the hatching. The vertical hatch line will update to the new location. 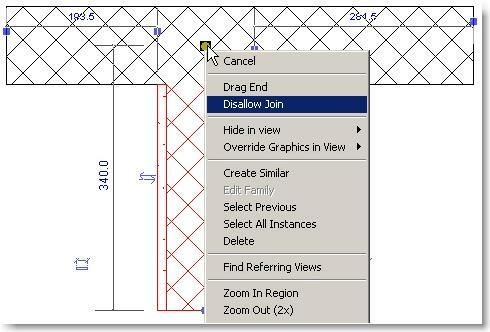 If you enable worksets allowing multiple users to access and share the same Revit model, you will notice that these rollbacks (or backups) no longer appear. 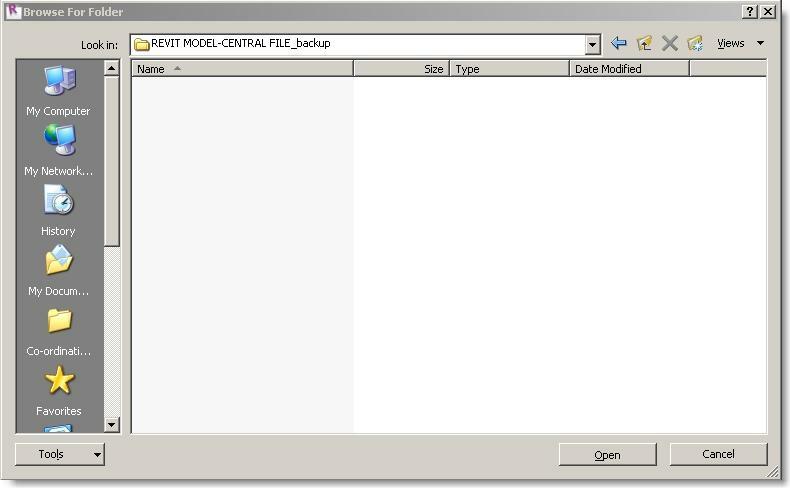 On a workset enabled model, by default Revit stores 20 backups of the central file but it is not possible to see or access these backups like the single user file. Browse to find your central file and look for the folder which has the suffix of _backup (this is usually in the same folder as the central Revit file). Double click to open and view the contents of this folder (but notice that nothing is in there?). Ignore the fact that nothing is in there and click ‘Open’. To preview an archived version you can simply select the version and click ‘Save As…’ and it will make a new independent model where ever you choose. 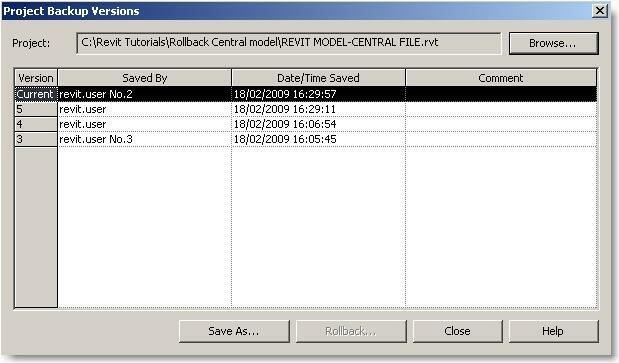 To make permanent changes to the ‘Live’ central file, use the ‘Rollback…’ button but BEWARE… this change is permanent and you will loose any changes made beyond this date. If 20 rollback versions just aren’t enough for you, you can change this to another number (but be careful as this will increase the file size of the backup folder). Example: Consider how many users will be working on the model and how many times they will be saving to central each day. 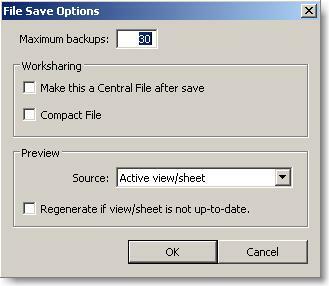 If you want to be able to roll the model back to the previous day, you will need to make sure your backups are more than the average daily Saves to Central. 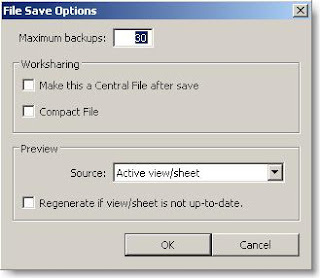 Open your local copy of the central file and click ‘Save As…’ In the dialogue box click ‘Options’ (bottom right) and change the number of backups to suit. Don’t bother changing the file name, just click save. If it tells you this file already exists, you can just overwrite it. That’s it done! The information is sent back to your central file and the number of backups to retain will be updated. 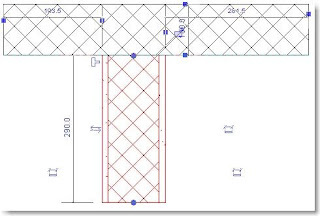 Using Revit for Surveys: A different approach to modelling in Revit is required when it comes to existing buildings. For instance, depending on the age and design of the building, a site survey would probably result in no two windows being exactly the same size. 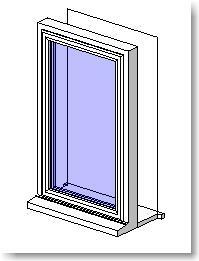 This raises the question “Should I create window types for every existing window?” Depending on the size of project and the scope of works involved this could mean hundreds of types. 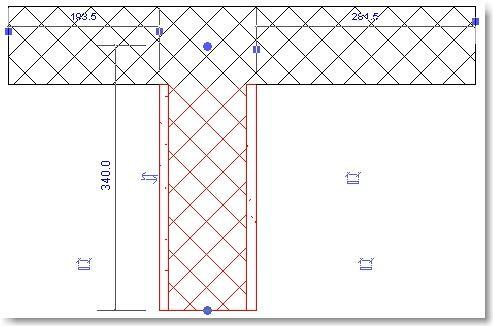 Consider what the purpose of the survey is and how the windows will be manipulated in the proposed design i.e. Are the windows being replaced? or just generated for model integrity and aesthetics? There could be numerous outcomes. Now go back into the Types and you will notice that the Width and Height can be modified. Change Rough Width & Rough Height to Instance Parameters first, then the Width & Height. Now go back to the Category & Parameters and set it back as Windows. Tada! You now have an instance based window! 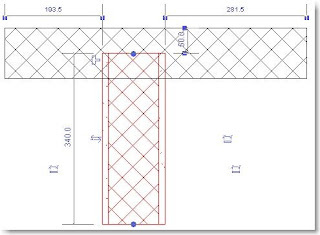 More often than not, building surveys require both an internal and external measured survey. 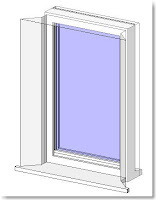 The external width of the window is measured from reveal-to-reveal, and also the inside edge from reveal-to-reveal. 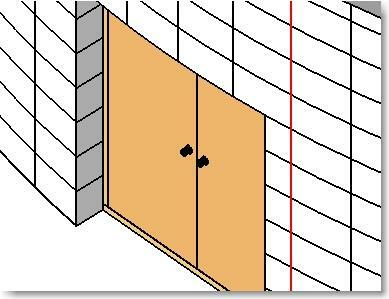 There is always a difference between the two measurements due to internal plasterboard or other finishes. I call this tolerance the ‘reveal setback’ as shown here. 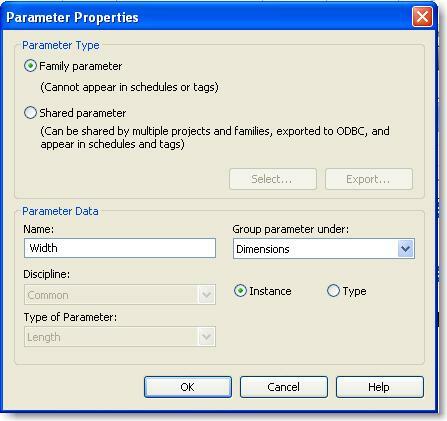 This is also modelled as an instance parameter so the user can stretch these to suit each individual window. Another key point to remember is that it is very awkward to stretch the windows when their origin is set to the centre. For survey windows I would recommend changing the origin (setting out point) to the left or right hand external reveal. You can do this by looking at the element properties of the reference plane and checking ‘Defines Origin’. 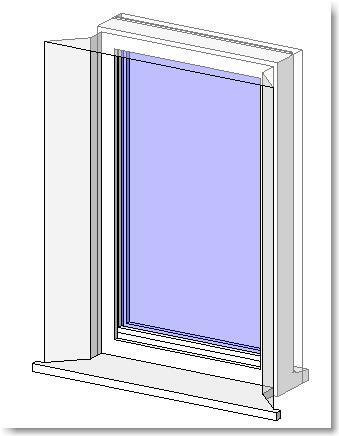 If you need splayed reveals (internally or externally), you will need to delete the default opening which is located on the back face of the window. 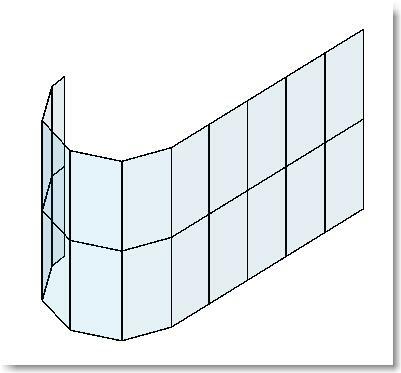 If you do this, you will no longer have an opening in your wall so you will need to create a void extrusion or sweep to create the desired window shape (this is required for any customised reveal opening). 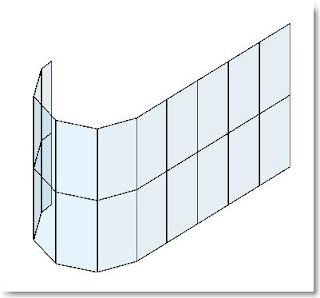 In my example I have used 4 Extrusions: 1 for the external opening width, 1 for the internal and two triangular fillets for the splayed reveals. Depending on your requirements you may want to change how you do this. I have also removed the cavity closer parameters and wrapping parameters to reduce the file size and make sure the parameter list is not looking overcomplicated. TIP: Create a Default Wall Material and set the colour to grey and transparency to 50%. 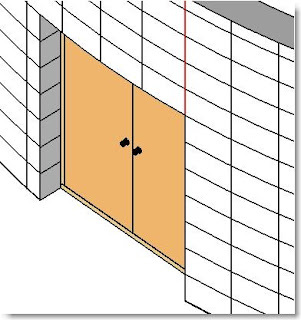 This will make it much easier to see what is going on with the 3D geometry as it passes through the wall. As with any modelling program there is more than one way to approach a task like this. 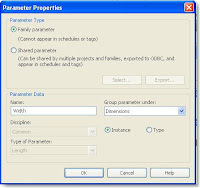 Other ways would include modelling windows as ‘Create In-place’ objects, or just using the normal ‘Type based’ windows. In-place would be my second choice but remember these aren’t reusable in other projects and they will mean you have to start from scratch every time! Type based windows can be used in some instances but just be aware of how many different Types you will need to create. If you only need 5 – 10 Types then maybe this is the better option? 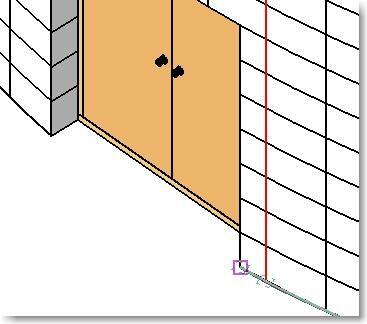 My experience would be that if you have a basic kit of instance based survey windows, doors which can be used in most situations, this is the most efficient and productive way of generating survey models again and again. If you have any other suggestions for building surveys I would like to here from you. 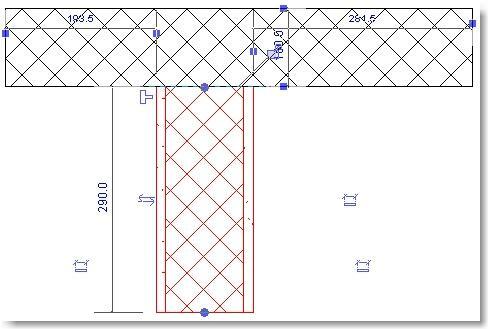 Here is the sample Revit Family rfa file used in this blog. 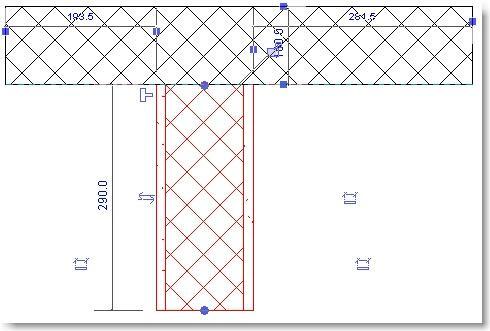 It’s modelled in Revit 2009 so any legacy Revit users can also view it. Here is a basic curtain wall with the system panel glazed making it faceted around the curve. 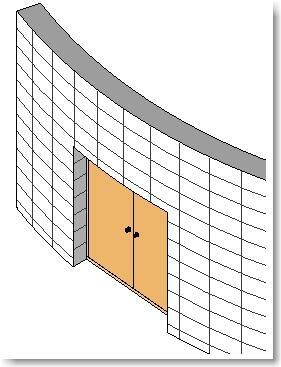 Start by creating a basic wall style which has a single layer 6mm thick and set the material to Glass. 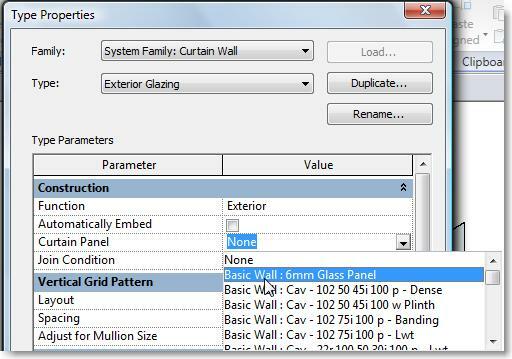 Pick the Curtain Wall System and edit it's Element Properties. 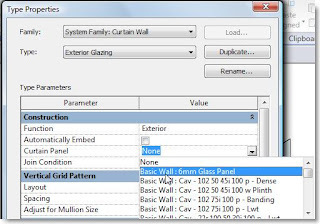 Set the default panel type to be the new basic wall style. 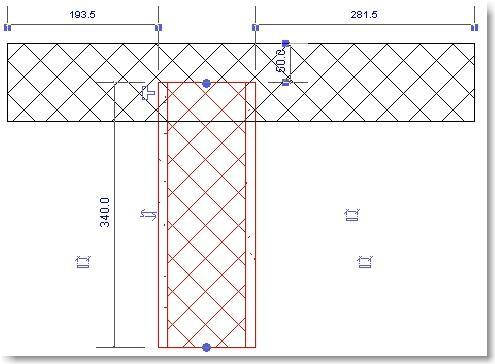 The 6mm Glass basic wall style will follow the curve rather than being faceted. Other suggestions for this technique would be to create cladding panels as basic wall styles. 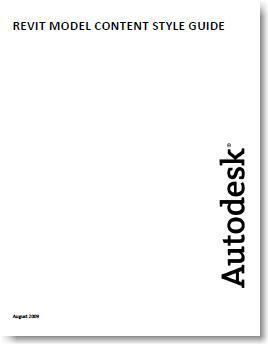 One of the freely available guides I refer to quite often is Autodesk's Revit Model Content Style Guide. 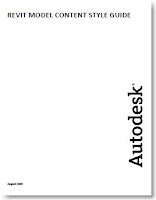 The guide is a downloadable zip file (40mb) containing excel documents, pdfs, example Revit Families and check lists. 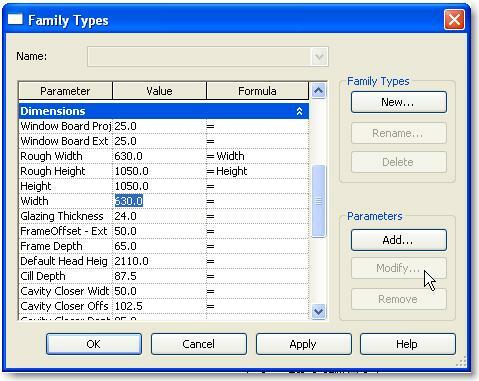 If you are looking to set some standards in your office for best practice Revit Family creation, I would certainly recommend looking through this kit. There are parts which I would debate (as with all guides), but generally it does give you an idea of the key topics which need addressing when creating your own content. On the whole its a great starting point for BIM Managers or BIM Coordinators to start out from when setting up Revit Family Creation Standards.